Winter brides, take note! Allure Films captured plenty of winter wedding inspiration while filming Francesca and Brian’s stunning Union League wedding video. The entire day was filled with laughter and plenty of fun. Even the first look gave us a giggle, with Brian’s adorable backwards wave as he heard his bride walking toward him. Brian and Francesca’s wedding party was a blast to be around, and we captured plenty of smiles and laughs in our “getting ready” footage. Francesca looked stunning in her wedding dress, with a fur coat to keep her warm and snug in Philadelphia’s frigid winter temperatures. The wedding took place at the Union League. Located in the heart of Philadelphia, it is one of our favorite places to film. There are so many beautiful rooms, soaring ceilings, jaw-dropping chandeliers, and impressive architectural accents that make every angle amazing. Documenting a romantic kiss on the iconic twin staircases is a must, and as always, we were not disappointed by the outcome of that perfect shot! As if the venue wasn’t stunning enough, Carl Allen Floral Designs took everything up a notch. Between their stunning arrangements, the upbeat live music from EBE’s Dreamtime, and the fabulous bride and groom, the wedding was truly picture perfect! Congratulations, Francesca and Brian, and thank you for letting Allure Films be a part of your wedding day! If you’re planning a winter wedding, there’s no doubt that you’ve had stunning visions of magical moments caught on camera as you and your loved ones enjoy a snowy sunset or lighthearted snowball fight. However, with these opportunities comes the risk of wintry weather creating a whole host of problems. Your Wedding Winter Wonderland could quickly be transformed into a mess of mud, slush, and shivering guests with the slightest shift in weather patterns! But wait! Before you pack up shop and move your festivities indoors, the experts at Allure Films have a few tips for keeping your guests warm and happy while ensuring you capture the moments you’ve envisioned. After all, you don’t get a second shot to live in the moment! Before you head out into the rain, snow, sleet, or cold temperatures, it’s important to have a plan first! Find out in advance which settings or backdrops you want, and who should be in each shot. Try to arrange a sequence of footage that require the same people so they can knock out all of their shots at once without waiting around in the cold. For those who aren’t needed at any particular time, let them wait inside and enjoy the warmth! When selecting your wedding party’s attire, think about the season and weather! Choose long dresses for your bridesmaids and consider gifting them a wrap, coat, faux fur shrug, or boots to wear as part of your winter theme. For the groomsmen, put them in wintry suits or tuxedos that are seasonally appropriate. Colorful mittens, matching scarves, or mugs of hot cocoa are fun ways to add personality to your wedding while also adding some real-life warmth. When any particular member of your wedding party is not needed, let them wait where it’s warm! If your location isn’t close to an indoor spot, consider renting a heater or building a small fire where guests can stay toasty. Another easy option is to keep a few cars parked close by with the heat on. Since you have a plan, it should be easy to get the right people positioned just as you have envisioned. Communicate your plan with your videographer and photographer so they know your expectations and can work cohesively. Don’t waste time fussing over who goes where while you’re waiting in the cold. Finally, be sure to instruct your team to capture as many shots as possible during the candid moments. Waiting for everyone to look at the camera and smile perfectly will only take longer and limit the footage you desire. Check out this highlight video of some of the most memorable winter moments filmed by Allure Films! Are you planning a winter wedding that will require outdoor footage? Let us know your thoughts and concerns in the comments below! Click here to speak with an Allure Films representative about hiring our expert videographers to capture your special winter wedding moments! 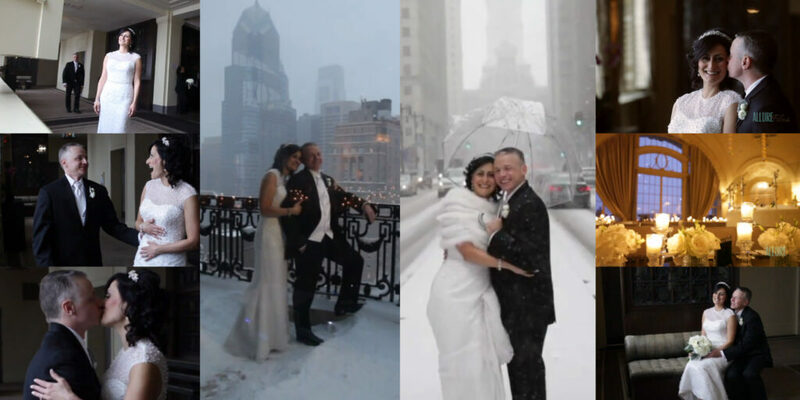 Is there anything more romantic that getting married in a snowy winter wonderland? With an exquisite ceremony at Hyatt at the Bellevue, and a room full of family & friends, Diane & John were truly surrounded with all the makings of a fabulous Philadelphia winter wedding. Following the ceremony, guests gathered on the 19th floor for a unique and beautiful reception at XIX Nineteen. From the bride and groom’s first reveal, to the winter wonderland scenery, Diane and John’s day was magical. We were glad our good friends from Philip Gabriel Photography were also in attendance to capture each moment in photos. Congratulations and best wishes to Diane and John!